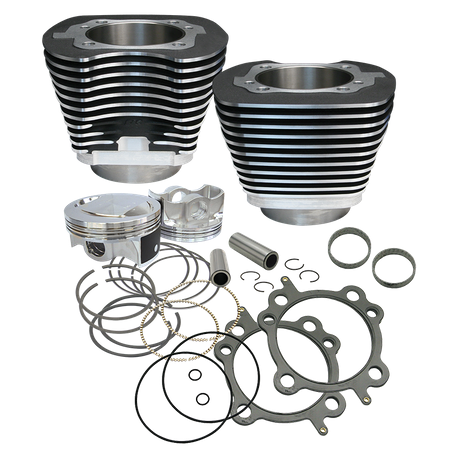 This bolt-on big bore cylinder and piston kit will increase the displacement of 88" engines to 97". It is as easy as a stock top end rebuild and requires no machining or flywheel rebalancing. For best performance, appropriate camshafts, performance air cleaner, performance exhaust and fuel system tuning are required. EFI engines will require tuning. S&S recommends S&S® VFI replacement Modules for model year 2000 engines with Magneti Marelli® EFI systems S&S recommends Dynojet® Power Vision® flash tuners for 2001-'06 engines with Delphi® EFI systems. Not legal for sale or use on CA or EPA pollution controlled motorcycles.